For the first time ever since I have been enrolled to vote in this country, I got the sense that political views on the importance of Indigenous issues had shifted. Yet the reason I felt this way was not due to an increase in Indigenous voices in the political discussions nor was it because either of the major parties announced a policy which I found remotely inspiring. Rather it was because, under the glare of the camera, the leaders of the two major parties both attempted to show a greater understanding of the Indigenous political agenda than they have before. It is fair to say both failed in their attempts. 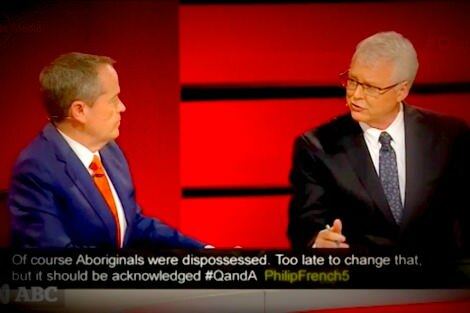 Bill Shorten, while on QandA, shocked both the audience and the show anchor Tony Jones when he plainly stated that the future ways forward for the Labor Party could include a treaty with Aboriginal and Torres Strait Islander people. Shorten, however, stumbled when talking about whether Australia was 'invaded' or not while also only referring to the concept of treaty as something to come after constitutional recognition. Picking up on Shorten's stumble, Malcolm Turnbull declared in a press conference the following day that Australia was indeed invaded, and there was no question of this. Turnbull then stumbled when he accused Shorten of putting the push for recognition in jeopardy by talking about treaties. This directly contradicts the government-funded Recognise campaign's own assurances that both these things can exist side by side. Last election constitutional recognition was about the only issue either party wanted to talk about when it came to Indigenous affairs. Anything else wasn't even on the radar. "It makes practical sense to see our rights protected before we consider any potential move to write us into a document that was built around our exclusion." The fact that politicians are using terms like 'treaty' in public forums while also decolonising historical understanding says something has shifted. That showing a greater commitment to Indigenous affairs beyond symbolic recognition is deemed to be a popular move at this time and could in fact change votes. A lot of this shift is, I feel, down to the activism of the Indigenous left over the past few years. Anyone who has been watching knows that constitutional recognition has been a contentious topic within the Indigenous community, bearing little resemblance to the apparent consensus successive governments have stated. The success of the Stop the Forced Closure rallies are a product of this, for what is a fight for treaty and sovereignty without protecting land. NAIDOC marches and Invasion Day rallies have in fact been branded Recognise-free zones. Views have been written from across the Aboriginal political spectrum regarding dissent including the concept of a 'seventh state' as raised by the questioner on QandA. This has been going on for a few years now. Yet these views continued to be, for the greater part, ignored by the Australian political establishment. Funding was continued to Recognise while many community-based programs went without. Vote Compasses continued to feature constitutional recognition as the only question they asked on Indigenous affairs. And until recent days, this remained the case. Yet Shorten's views on future treaties cannot be celebrated. The idea that any treaty must be a post constitutional recognition move is rejected by a lot of Aboriginal people who are pushing for treaties and recognition of sovereignty. Why? Because our rights as Original Peoples must be protected first. This has been the ongoing source of injustice in this country. The legal fiction of Terra Nullius is the basis on which this country was founded and, despite having been long overturned, it still permeates much of the policy and understanding. This is why we're still calling for land and cultural rights, why we continue to be the victims of bad, imposed government policy, and why we still have severely impoverished communities crying out for the most basic of service provision, as a given rather than as a reward for compliance. It makes practical sense to see our rights protected before we consider any potential move to write us into a document that was built around our exclusion. Turnbull's push, on the other hand, showed that while he is engaging in ideas of sovereignty, he doesn't wish to touch this in any practical sense. Indeed, his views that treaty discussions would negate constitutional recognition show he wishes to avoid sovereignty discussions at all costs. Acknowledging the oldest artworks in the world (what they are, more accurately, are religious symbols and historical narratives) in a reverential way does not denote a commitment to justice. When it comes to discussions on Indigenous rights in this country, both parties are severely lacking. Yet the fact that they are being forced to address these issues and have answers for the questioning public shows that, right now, social engagement on Indigenous issues is possibly at a higher level than it has been for decades. And it shows that these politicians are aware there is a strong Indigenous community holding them to account. I would have thought that it was obvious that a treaty, if it is to be a real treaty, must come before recognition. There are necessarily two parties to a treaty, each with the ability to consent or otherwise. Recognition, on the other hand, requires the action of only one party. No matter what the actual wording, it would still be a gratuitous act of a conqueror over those considered to be conquered. It would resolve nothing. Sovereignty is an empirical condition: the ability to exclude others from your territory. Invaders acquire (by force) sovereignty from those invaded. If the invaded want to retrieve their former sovereignty, they have to expel the invaders by force or receive by (as Ginger Meggs might say) "a gratuitous act of a conqueror" the gift of sovereignty, which is how nations become independent. To say that you have not ceded sovereignty is an inaccurate (but politically useful) way of saying that it was unjustly taken away from you and that you have a moral claim to its return. But, do the descendants of the original population necessarily have, by inheritance, a moral claim to its return? The culprits and their victims died over 200 years ago. ATSI and non-ATSI 'Australians' are all different people now, all living non-ATSIs today bearing no guilt whatsoever for invasion and the ATSIs living in a first world economy because unlike, say, PNG, entrepreneurial Northern Europeans regarded Australia as their home rather than as a colony to exploit. Times and circumstances have changed too much since 1788 for a meaningful gift of sovereignty to what is now a mere one-fortieth of the population. I agree with Kathy, a great article. Go, you good thing, Celeste! In his book "No Small Change" Frank Brennan quotes from Paul Hasluck's last book "Shades of Darkness" published in 1988: "...whether Australians of aboriginal origin are to live together with other Australians, or apart from them; are they to have the same opportunities or different opportunities; are they to bear the same responsibilities and be subject to the same laws or are they to be regarded as a 'lesser breed' from whom less should be required? Is Australia to have one society or two societies?". We are one. Agree, Ginger Meggs. A treaty establishes or recognises sovereignty of the Aboriginal peoples and of necessity could only be automatically followed by recognition. Great article that should be read by all Australians. Great piece, thanks Celeste. It seems to me that the major injustice from a lack of treaty is that the land that was stolen and the wealth it has created has never been shared with indigenous people in Australia. The spectre of 'handouts' continues. treaty and recompense NOW, I say. Roy, do I have some right to the return of my grandfather's watch that was stolen from him when he was alive? Or is it now the property of the thief's grandchildren because they did not actually do the stealing? Why are you (still) so hung up on 'guilt'? Celeste never used the word. Isn't it enough to acknowledge that we have all benefited from the acts of dispossession? And what is so important about 1788? The process of dispossession didn't finish then. Don't you remember Deputy PM Tim Fisher, after the Mabo decision, promising 'bucket loads of [native title] extinguishment', which the Howard government then enacted into law in 1998? Go and read some history Roy, and not just eighteenth-century history, and read a range of historians, not just journalists posing as historians. "Roy, do I have some right to the return of my grandfather's watch that was stolen from him when he was alive? Or is it now the property of the thief's grandchildren because they did not actually do the stealing?" When Shylock demanded his pound of flesh, he was thwarted because the flesh could not be had without blood. The ATSI land at occupation cannot be returned without the improvements that have accrued to them by European factors of production. It's not the same land anymore. If thousands of dollars' worth of innovations had been made to grandfather's watch by the thief's descendants, a court could well decide that the character of the watch had been changed so much by their efforts that it would be unjust to them to donate the extra value they'd added to it to you. If you believe ATSIs are sovereign, you would have, for example, to support returning Botany Bay and even all of Sydney to the original residents of the location. Even if the local tribes didn't want Sydney back, it still shows that, as a principle, the sovereignty idea is logically flawed. 'I'm doing it for my kids.' This is how some supporters of Brexit explained their position before the referendum. Yet 75 per cent of voters aged 18 to 24 voted to Remain. It seems the message from 'the kids' to older voters was 'thanks, but no thanks'. The same can be seen in domestic politics here in Australia. We often hear politicians and voters talk about the effects of a policy on future generations. Yet the issues of concern to young people themselves simply don't get much attention. Whether or not the person in the now notorious 'fake tradie' ad is or isn't a 'real' tradie is irrelevant. What is relevant is that it is a primary example of the co-option of the language of class struggle and economic justice that has so thoroughly poisoned economic debate in the industrialised West. Implicit within it is a patronising view of the working class that dismisses them as gullible dupes who can be made to entrench the privilege of the few in return for the paltry crumbs of consumer hedonism.